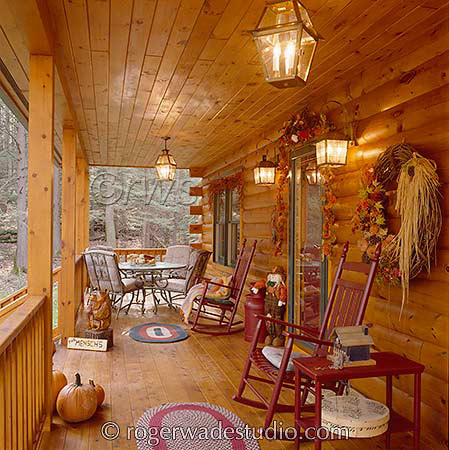 Everyone loves to look at log home pictures! We have some beauties for you here. 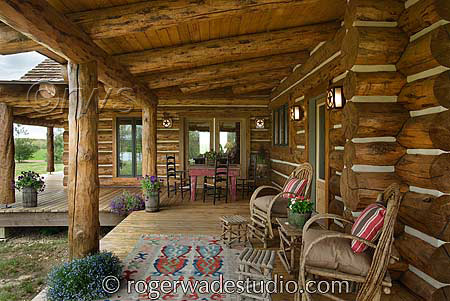 Log homes are a modernized version of yesterday's log cabin. 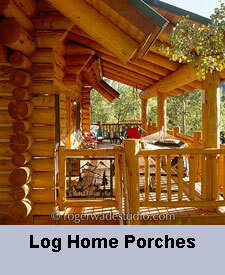 But log homes today are stronger and more safe. 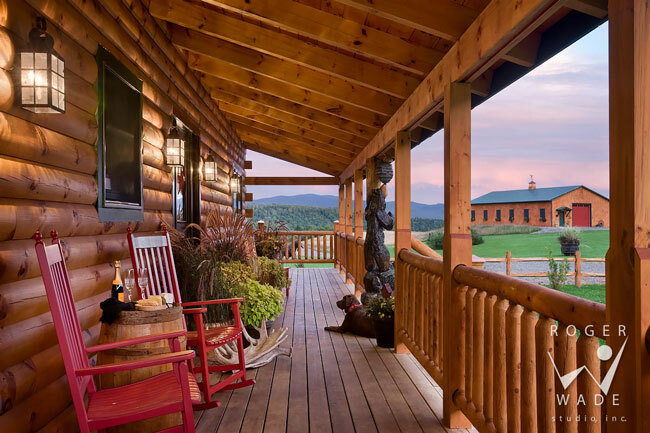 Custom log homes are constructed from milled timbers and use tongue-and-groove interlocking systems to eliminate air and water problems. 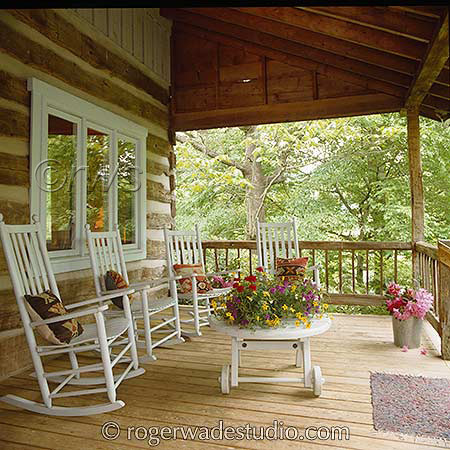 For the DIY'er, log home kits come as packages and can include logs that are pre cut and numbered for porches, roofs, windows, doors, interior partitions, stairs, railings and garage doors. 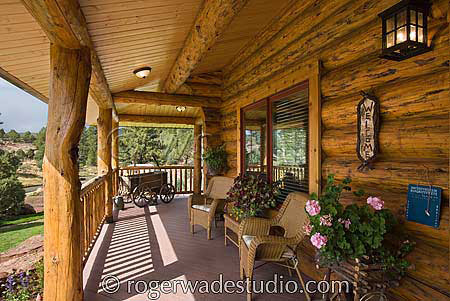 You've come to the right place for log home pictures - we've got the "best of the "best" thanks to the generosity of architectural photographer Roger Wade. 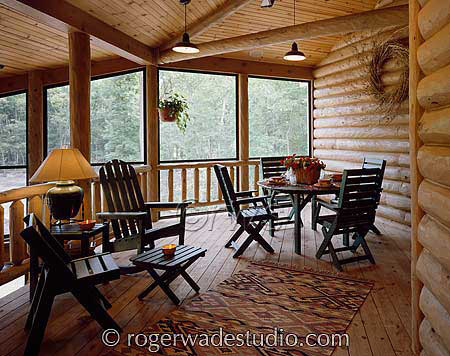 A renowned architectural photographer, Roger regularly contributes to a myriad of publications and journals. 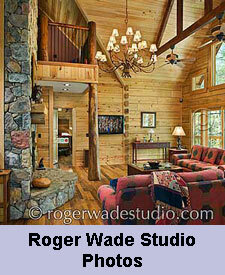 Learn more about Roger Wade Studio. Photos are copyrighted; please do not use. 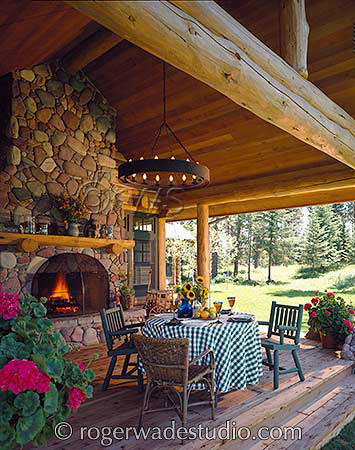 Now that you've seen some fantastic log home photos, here's a quick guide to help you differentiate between a log home, a post and beam home, and a timber frame home. 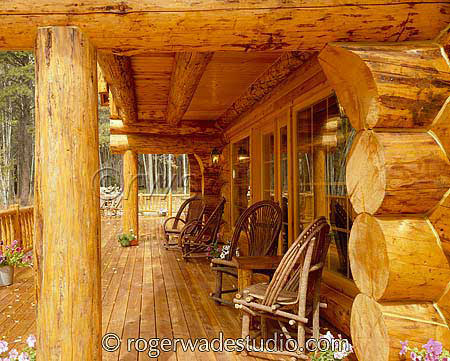 A log home is usually built with large wooden logs stacked horizontally to form walls. 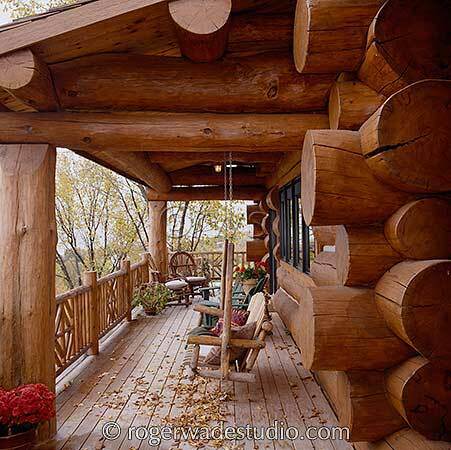 The logs can be sized and shaped to simplify the building process and to prevent difficulties such as settling or insulating. 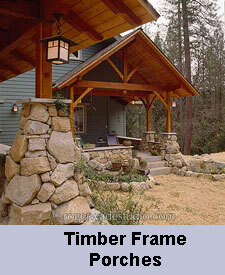 A timber frame home design (like the one at right) is a specific kind of post and beam home that uses mortise and tenon joinery and wooden pegs to hold the squared-off timbers together. 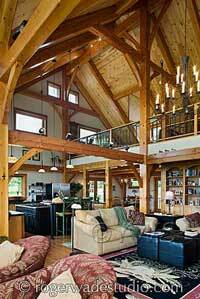 A post and beam home uses large logs positioned upright to support beams. 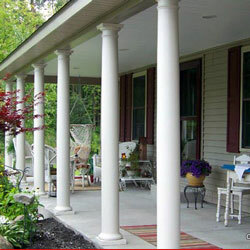 The posts and beams can be left round or squared depending on the design. 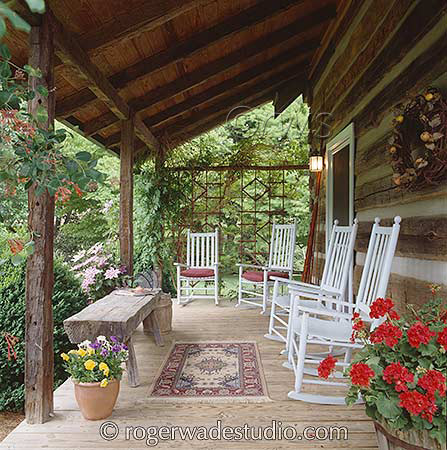 The logs may be attached to each other by metal brackets or plates, bolts, screws, or mortise and tenon joinery. 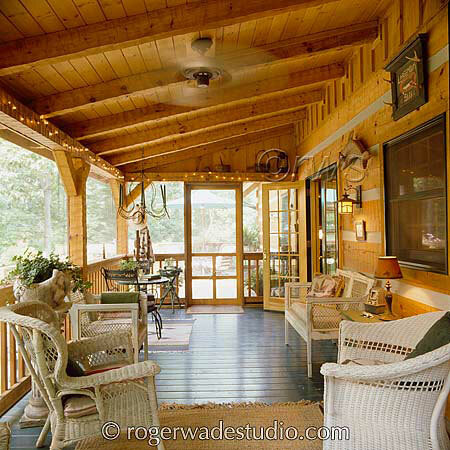 If you love log homes, click on the pictures below to see more amazing porches and porch ideas! 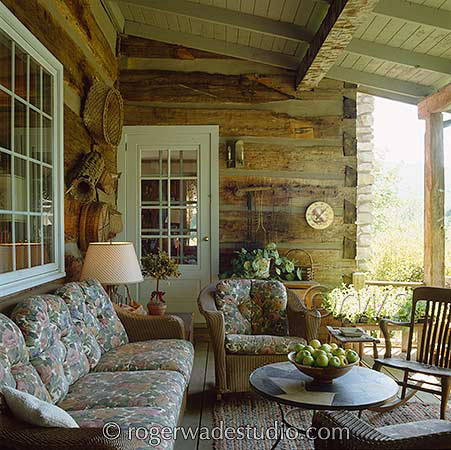 Architectural photographer Roger Wade travels extensively within the United States and Canada to photograph residential and commercial architecture. 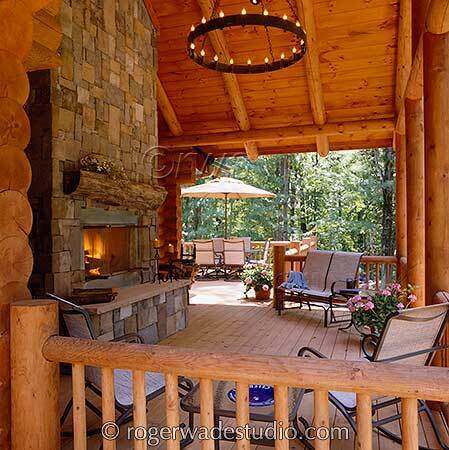 Along with log home and timber frame home companies and resorts his clients also include architects, interior designers, home builders, and developers. 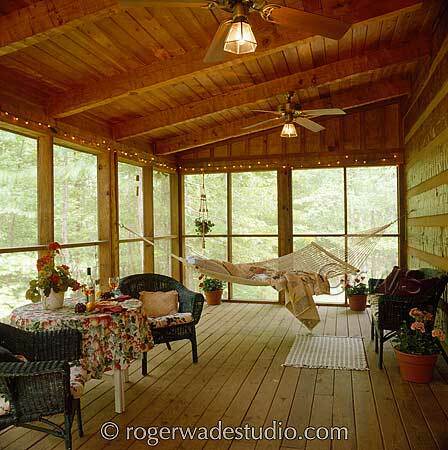 His works appear not only in Architectural Digest magazine but also in many architectural design books and shelter industry publications. 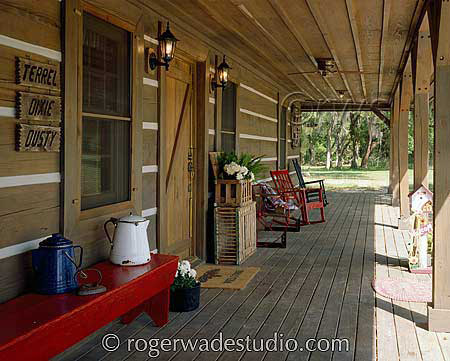 Please visit our page about about Roger Wade Studio, Inc., to learn more about his photos and a special link to more photos. Our thanks to the many architects who design these beautiful homes.